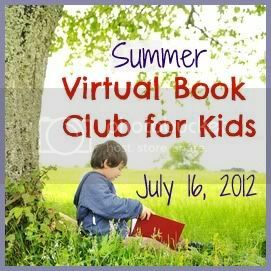 Welcome back to the Summer Virtual Book Club! This month we are sharing book activities for our featured authors, Audrey Wood, Don Wood and Bruce Wood. This month, we chose the book "Ten Little Fish" by Audrey and Bruce Wood. I previously reviewed this story on Ready. Set. Read in my Beach Books round up. Ten Little Fish is a fun counting backwards book. We created a paper plate aquarium and wrote a math sentence to go with our picture. 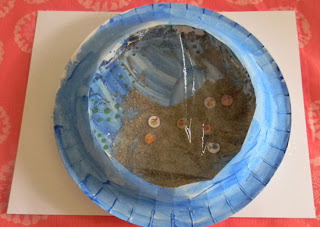 We found the paper plate aquarium idea on Make and Takes Storybook Summer Series. The aquarium idea came from a guest post by Create-Celebrate- Explore. You can find the tutorial here. To make our activity follow the book, Ten Little Fish. We added fish stickers to our aquarium. I gave the boys 10 stickers each. They could choose how many they wanted to put into the aquarium. After the craft was finished, we made up math stories about our aquariums. 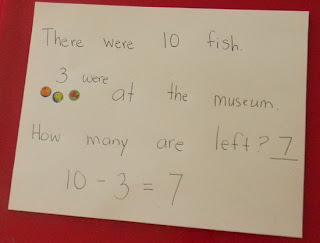 We wrote how many fish we had when we began (10). Then the boys made up a story for where the "leftover" fish were going and stuck those "leftovers" to their papers. Finally, I wrote the question, "How many were left?" The boys used their aquariums to count the fish left inside the ocean and answer the question, "How many were left?" Then we wrote a math sentence to tell our story. It was fun to show the boys that we can tell stories in words and in numbers! We've been enjoying books by Audrey and Don Wood and Bruce Wood. We have another fun Wood book activity coming soon. I plan to link it to the Summer Virtual Book Club linky party. If you have a fun book activity for these authors, make sure you link it up to the July Summer Virtual Book Club. Last month, we had over 50 entries for our featured author, Mo Willems. Hope to see you in the Summer Virtual Book Club! Link up only posts inspired by Don and/or Audrey Wood that share children's book inspired crafts, activities, recipes, etc. Any other posts will be deleted. Visit other blog posts on the linky and comment on or share the ones you love! Add our Virtual Book Club to your post if you'd like. * By linking to this blog hop you are giving the blog hop participants permission to pin images from your post onto Pinterest. This blog hop will be open from July 16th (12am PST) to August 19th. Love the aquarium! It is super cute! I love the aquarium idea too. What a great way to practice counting! What a fun beach connection! Perfect for summer. I have never tried using a paper plate that way and will need to do it. My kids LOVE sand and anything related to fishies! I love aquarium and the math sentence! This whole blog hop idea is such a neat one for sharing resources and enthusiasm! 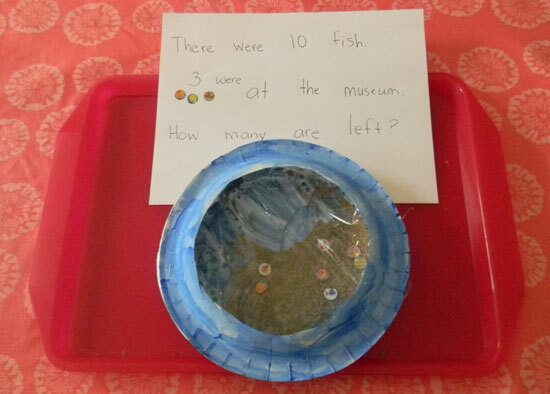 I love the paper plate aquarium and the math activity complete with stickers as a visual reminder and counting helper. Please stop by and link this post to Artsy Play Wednesday today on Capri + 3, a new weekly linky featuring arts, crafts and play activities for children. I hope to see you there.